The Idaho-Maryland Mine, located in the Grass Valley mining district of northern California was one of the most productive and best known gold mines in the Unites States, with gold production from the property dating back to 1863. The Idaho-Maryland Mine, as it now exists, represents a consolidation of a number of important early day producing mines including Eureka, Idaho, Maryland, Brunswick, and Union Hill Mines. Based on historic production records, the I-M Mine produced a total of 2.4M oz gold at an average mill head grade of approximately 0.5oz/ton (17.1gpt). The I-M Mine was reportedly the second largest gold mine in the United States in 1941 (Clark, 2005), producing up to 129,000 oz gold per year before being forced to shut down by the US government in 1942 (Shore, 1943). Due to lack of development, a decline in gold production was experienced and recovery from war-time shutdown never occurred. The Idaho-Maryland Mine has a rich history of mining work completed between 1863 and 1956 by various operators. The Property and its comprehensive collection of original documents was rediscovered in 1990 and efforts were made to reopen the historic mine; however, the operator was unsuccessful due to inability to raise necessary funding in unfavourable market conditions. The information presented here within has drawn from the history previously described in multiple reports of the Property and Jack Clark’s book Gold in Quartz. Gold discovery, mining activity, and significant events, in addition to ownership of the property and ownership changes, are described chronologically for the important gold veins that constitute the Idaho-Maryland Mine Property. The mine is purchased by Fricot and others, and is worked at a loss until 1863. Eureka Gold Mining Company purchased the Eureka Mine. Eureka Mine became leading gold-producer in the United States; maintained lead position until 1871. Between the 100ft and 200ft levels the ore averaged $37/ton (1.79oz/ton, 61gpt) and from 200ft level down to 600ft level the ore increased in value to $50/ton (2.41oz/ton, 83gpt)) over an average width of 3ft. Eureka Gold Mining Co. failed to find additional resources; company forced to shut-down mine. Idaho claim recorded. Original discovery of Idaho vein, the eastern extension of the Eureka Vein, believed to have been discovered in 1850s in the bed of Wolf Creek. Shaft sinking operation commenced to intersect vein at 150ft below surface. Due to lack of capital, all work ceased in 1866. Idaho Quartz Mining Company, organized by the Coleman brothers, bought the Idaho Mine. Ore shoot struck at 300ft below surface. Subsequently a stamp mill was erected. By 1870, the Idaho shaft extended more than 600ft below surface. The Idaho shaft had been development more than 600ft below surface with levels developed at 100-foot intervals. Idaho Mine surpasses the Eureka Mine as the leading gold-producer in California. Held position until 1892. From 1868 to 1892, Idaho Quartz Mining Co. milled a total of 567,029 tons resulting in 574,434 oz of gold. Operations ceased as the mine reached their claim boundary to the east. Maryland Mine located in the adjacent claim. James K. Byre’s claim for Union Hill Gold Quartz Mine was recorded. The mine worked profitably until 1870. Union Hill Mine reopened and operated until 1911. Mine was reopened again by Gold Point Consolidated Mines, Inc. and was operated until 1919. Union Hill Mine was purchased by Idaho-Maryland Mines Company. Maryland Mine claims were staked. 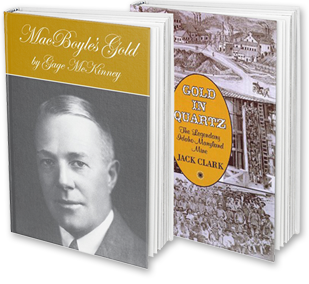 Maryland Gold Quartz Mining Company was formed and commenced work on the Maryland Mine. Brunswick Mine was located in the mid 1800’s, although the exact date is unknown. Brunswick Mine had only been worked to a depth of 300ft by an inclined shaft, Old Brunswick Shaft. The three-compartment inclined shaft had reached a depth of 700ft and later it continued to the 1250ft level where extensive lateral development work was undertaken resulting in good ore discoveries. The Brunswick owners, Brunswick Consolidated Gold Mining Company constructed a new four compartment vertical shaft, the New Brunswick Shaft. Simultaneously, a steel head-frame and a complete 20-stamp mill and cyanide plant were installed. The method of handling and treating the ore was greatly improved and the operating costs materially reduced. Maryland Gold Quartz Mining Co. purchases the Idaho Quartz Mining Co. and its Idaho Mine. The name is changed to Idaho-Maryland Mine. Subsequently, Dorsey (#2) Vein is discovered. The son of the principal owner and mine superintendent, Victor Dorsey, is killed in the mine from a ground fall in the Dorsey Winze below the 1600ft level. Idaho-Maryland Mine closes due to insufficient capital. Total production of 60,282oz gold from 1894 to 1901. The Idaho Maryland Mine was bonded to Idaho Maryland Development Company. The Company sought out gold production from the upper levels of the mine as they completed surface repairs, mine dewatering, and shaft retimbering. Idaho Maryland Development Co. ceased operations at the beginning of WWI. Total gold production from 1904 to 1914 was 15,076 oz. Idaho-Maryland Mine interests the mining engineer Errol MacBoyle. Backed by various investors with controlling interest, MacBoyle acquires adjacent mining claims. The final property, the Idaho-Maryland Mine including Union Hill Mine, is acquired from the Dorsey family for $187,693. The Metals Exploration Company has controlling interest in the consolidated group of mines. The Idaho-Maryland Mines Company is formed to operate the Idaho-Maryland Mine, while the Metals Exploration Co. continues to finance the operation. At the time, Union Hill Mine was the only mine in operation. Errol MacBoyle continues as consulting engineer for the operation. Construction of the Idaho surface plant is completed; while underground operations focused on exploration of the Eureka-Idaho-Maryland (#1 Vein) below 1000L. A prospect drill is purchased and put into immediate use. The Idaho shaft sinking operation is completed to 2000L. Due to the large amount of underground development and significantly less gold production, the Company suffered a net loss. The Idaho-Maryland Mine is shut down. Subsequently, Errol MacBoyle set out to raise money to keep the pumps running and prevent the underground workings from being flooded. Total gold production from 1919 to 1925 was 9,676 oz. Errol MacBoyle and associates form holding company, Idaho Maryland Consolidated Mines, Inc., and make deal with Metals Exploration Co. to acquire the Idaho-Maryland Mine. Idaho Maryland Consolidated Mines, Inc. is holding company of Idaho-Maryland Mines Company. Under management of Errol MacBoyle, mine operations recommence under a tribute (lease) system. Gold production from the tribute miners kept the mill continuously running. MacBoyle (through Idaho Maryland Consolidated Mines, Inc.) acquired the adjacent property, the Brunswick Mine by secretly buying a majority of the shares. Brunswick operators, Brunswick Consolidated Gold Mining Company, capitulated allowing MacBoyle to take over. MacBoyle’s geological theories are proven by relocating the faulted No. 1900 Vein (#3 Vein). Discovery of the strong vein unlocks the riches of the Idaho-Maryland Mine. Discovery of #4 Vein which split off from the 1900 Vein (#3 Vein). By December 1931, the Company had paid off all its debts. Insufficient milling capacity (20 stamp mill) created restraints on underground production; Company begins modifying Brunswick mill to double gold production. Idaho Maryland Mines Co. leased the Brunswick Mine from Idaho Maryland Consolidated Mines Inc. Work commences to reopen Brunswick Mine. Price of gold increased from $20.37/oz to $35/oz. Enabled mining of “marginal” veins at a profit. Modernization of the Idaho-Maryland surface plant is completed, including addition of a new mill and cyanide plant. The new Idaho-Maryland mill is a huge success; plan to rebuild New Brunswick mill as an exact duplicate. Idaho Maryland Consolidated Mines Inc. merged with its opening company, Idaho Maryland Mines Co. to simplify the corporate organization. “Round Hole” shaft in Idaho Mine is completed to 1000L. The new 350 ton/day leaching plant was completed enabling production in the New Brunswick mill to increase to 500 tons/day. Old Brunswick Mine shut down for economic reasons; although, development work in Idaho and New Brunswick remained prosperous. Combined production averaged approximately 1000 tons/day – 300 tons from Idaho-Maryland mill and 700 tons from New Brunswick mill. Gold production greater than any other year in mine history. Idaho Maryland Mines Corporation (IMMC) achieved largest gold production in California with 117,000 oz gold produced. A connection was established between Idaho-Maryland Mine and New Brunswick Mine on 2300L (Brunswick). Development to deepen the New Brunswick shaft continued along with New Brunswick surface plant modernization work. Total gold production for 1940 was 129,000 oz. Details of I-M Mine are kept secret; Errol MacBoyle does not allow USGS into the mine. “The only mine of major importance to which access was not given is the Idaho-Maryland…”, “It is to be hoped that the geologic staff of the company will be permitted to publish the results of their studies pursued actively since 1931, for the Idaho-Maryland mine holds the key to the complex geology of the serpentine belt” (Johnston, 1940). Modernized mill at New Brunswick placed back into production. Completion of New Brunswick headframe, crusher plant, hoists, and new compressors gave the corporation one of the finest and most efficient plants in the Country, “this equipment was designed to handle 2,000 tons a day from depths of 5,000 feet” (Pehrson & Needham, 1943). New Brunswick shaft sinking completed to 3,470ft. Simultaneously, three new ore bodies are discovered. Manpower lost to the war effort which caused decreased production. As a result of WWII, US government issued Limitation Order L-208 requiring all gold mines to shut down. IMMC maintains minimal employees on payroll to keep underground pumps operating. Underground inspection of Idaho Mine 8 months after closure showed major damage; timbers had been weakened by decay and swelling of serpentine ground. Brunswick Mine remained in relatively good condition. In October, Errol MacBoyle suffered a stroke, paralyzing the right side of his body. IMMC was granted permission to produce a maximum of 7,800 tons of mineralized material per month. Mining was exclusively in the Brunswick Mine, while recapture and timber repair was completed in Idaho Mine. Limitation Order L-208 was lifted by the US government. The Company re-established its workforce, although much smaller than pre-shutdown numbers and worked mainly in Brunswick Mine. Due to the loss of higher-value reserves in the Idaho Mine, it became necessary to increase development operations to find new veins and increase tonnage of the lower-grade Brunswick veins. To reduce operating costs, mining was completed through a tribute (lease) system. Costs to recapture caved raises and drifts became too expensive. All company work focused on development of a new vein, 52 Vein, on Idaho 2700L and #4 Vein in Brunswick. New vein was discovered on Idaho 2400L by diamond drilling. Although, the vein was not developed because the company had insufficient development funds and there was no available underground space to dispose of waste rock. On November 4th Errol MacBoyle passed away in his sleep. A steel headframe was built to replace the old headframe at the Old Brunswick shaft. A connection between Idaho and Brunswick was established on 3280L (Brunswick). Development and exploration progressed in the hopes of discovering new ore close to existing workings while IMMC continued to operate at a loss. All leases in the mine were discontinued by September. Diamond drilling was continued in search of new veins and development work continued with limited funds. In November, employee reduction of surface and underground crews brought down the workforce to 90 people. Several parcels of unessential land were sold. A priority was given to explore the Idaho levels on 60 Winze, although there was no underground space to stockpile waste so the waste rock was moved as ore, causing dilution. Exploration for scheelite in 19 and 45 Veins was found to be sufficient to justify the installation of a mill. The Idaho mill was modified to extract tungsten. By May, all development work, except work involving tungsten exploration, was stoped. Mining was restricted to only stoping higher-grade quartz. By December, all mining and milling of gold was discontinued; operations focused only on production of tungsten. Tungsten exploration was subsidized by the US government. Company allowed mine to flood to 1450L and minimal tungsten production occurred near Union Hill Mine. In December, the California Division of Industrial Safety ordered Idaho Maryland Mining Co. to cease mining near the flooded Union Hill mine forcing the mine to shut down. Two-day auction held to liquidate mine equipment and structures. Auction sales enabled payment of all outstanding debts. William and Marian Ghidotti purchase the Idaho-Maryland Mine property, including subsurface mineral rights, from Idaho-Maryland Industries Inc. (successor of Idaho Maryland Mining Co.) at an auction for the price of $52,500. The BET Group acquires the Idaho-Maryland Mine property, along with all mineral rights that Marian Ghidotti owned in connection with the Idaho-Maryland and Brunswick Mine Properties, through the “Ghidotti Estate Order”. The BET Group is comprised of three parties (1) Mary Bouma, (2) Erika Erickson, and (3) William Toms, each representing an undivided 1/3 interest. Consolidated Del Norte Ventures Inc. learns of the Idaho-Maryland Mine and historical collection of maps and documents secured by the BET Group. Company retains James Askew Associates, Inc. (JAA, Inc.) to complete a preliminary investigation of the mine records. Investigation concluded that sufficient geological evidence of the presence of gold-quartz-mineralization to warrant further investigation. Idaho-Maryland Mining Corporation (formerly Consolidated Del Norte Ventures Inc.) commissions JAA, Inc. to complete technical report on the property. Emperor Gold Corp. (through its subsidiary Idaho-Maryland Mining Corporation) secures a mining lease and option to purchase 100% interest in the Idaho-Maryland Property from the BET Group. The consideration for the 7 year lease is a minimum royalty of US$100,000 per year subject to consumer price index adjustment and a net smelter royalty (ranging from 4% to 8%) in any calendar month. The option agreement is to purchase the mine for US$8,000,000 net of option payments, along with minimum royalty and production payments. Emperor Gold Corp. signs an option to purchase for $2,000,000 USD with Sierra Pacific Industries for 82acre land at Brunswick Rd and East Bennett Rd (Mill Site Property). An Environmental Impact Report (EIR) was completed to dewater and explore the mine. Nevada County accepts application and grants permits. However, in the late 1990’s the permits to dewater the mine were cancelled or expired. Emgold Mining Corporation (formerly Emperor Gold Corp.) renegotiated the terms and conditions of a lease option to purchase agreement (BET Agreement). Emgold acquires licensing rights to “Ceramext”, a ceramics technology process. Emgold plans to utilize technology by making ceramic tiles from mine tailings and waste rock. Emgold completed a surface exploration program on the Idaho-Maryland Mine property. Included 21,335ft (6502m) of diamond drilling from twenty-six (26) drill holes and approximately 3,537ft (1078m) of geotechnical drilling. Subsequently, an NI43-101 Preliminary Assessment Technical Report was prepared by AMEC on the I-M Project describing the staged development of the project to reopen the mine and construction of a commercial ceramics production facility. Emgold commenced permitting of the I-M Project to construct a commercial ceramics production facility and reopen the mine on the Idaho land. Necessary documentation is prepared for submission of the Project Application to the City of Grass Valley for the required Conditional Use Permit is prepared. Emgold completes Revised Project Application for the I-M Project which was accepted by the City in May 2007. A Draft Environmental Impact Report (EIR) was completed on the Idaho-Maryland Mine Project by ESA. The public hearings for the Draft EIR were completed in January 2009. Emgold elected to make several improvements to the I-M Project based on its review and analysis of public comment. The BET Agreement is extended until 2013. Emgold completed a Revised Project Application which was accepted by the City of Grass Valley in May 2011. Preparation of the EIR by the City for permitting of the I-M Project was placed on hold while Emgold waited for improved equity market conditions to raise the necessary funds for the application process. The City of Grass Valley gives deadline of September 2012 to secure funds for Project Application. Due to worsened market conditions, Emgold is forced to allow the application to be withdrawn.